December 25, 2010 Dan O. Reason why I don’t ever bring my ladies around to the crib during Christmas. Although their relationship works in the city, things begin to fall apart for buttoned-up Manhattanites Everett (Dermot Mulroney) and Meredith (Sarah Jessica Parker) when they visit the suburbs for the holidays to stay with Everett’s family. Sarah’s first meeting with Everett’s parents (Diane Keaton and Craig T. Nelson) proves so traumatic that she calls in her sister (Claire Danes) for backup — a move that only makes Christmas more complicated. I was completley surprised by this film. Now I remember seeing this way back when, and at least enjoying it for that matter, but I didn’t take it all in. Now that it’s Christmas time, I really do like this one. The one thing that really shocked me was how good the writing actually is. There are plenty of moments of well-deserved humor, that will either have you chuckling, or laughing out loud, all depending on your type of comedy. However, there are also plenty of touching moments that may tug at some heart strings. I think the best thing about this film is that it’s all about family. How everybody in it, no matter how crazy, or nuts they may be, you care for them all. It’s set in Christmas and shows a lot of the shenanigans that can occur during this time, but the real treat is watching how each and every family member interacts with each other. You feel like your apart of the family, and that’s not a bad thing, cause you like them all. However, my one main problem with this film is that it’s tone awkwardly shifts all over the place. There are moments of humor, but then there are just very, very serious moments, that really get to you, and you wonder just what kind of film is this. It plays back and forth between comedy, drama, and also tragedy, but the constant shifting was kind of annoying, but it didn’t ruin my experience. I just knew it could have been way better. The ensemble cast is what really had me watching the whole time. Diane Keaton and Craig T. Nelson are perfect as this aging couple that really just wants there family together, as they hold a secret that’s very near, and dear to them. Sarah Jessica Parker is actually very good in a role that requires here to be charming, but also awkward, with a hint of confusion, and she surprisingly pulls it off pretty well, which I was not expecting. Dermot Mulroney as usual is just amazing here, providing plenty of key dramatic scenes. 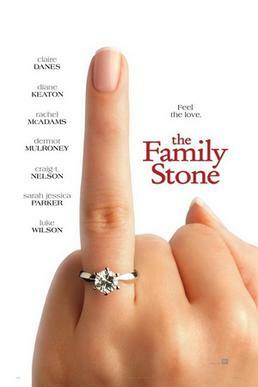 Luke Wilson also brings humor with his perfect comedic timing, and this film is no different. Rachel McAdams plays a pretty mean person in this film, but then she starts to grow on us, and we start to actually enjoy her presence. Claire Danes pops up, and her character is likable, mainly also thanks to Danes’ appeal. Consensus: The ensemble is strong, and the writing has many funny moments, as well as touching, but the awkward shift in tone for this film provided too much confusion as to what it wanted to be. Not a bad movie at all but I think it sags a little bit here and there. I think a stronger lead than Sarah Jessica Parker would have made this movie that much more enjoyable. Except for that, absolutely loved the cast. Hey with what I got I was glad. Good stuff!